Creative Innovation 2013 Asia Pacific was an outstanding event that explored The Race to the Future E6: Environment, Energy, Economy, Education, Entrepreneurship, Ethical Leadership. 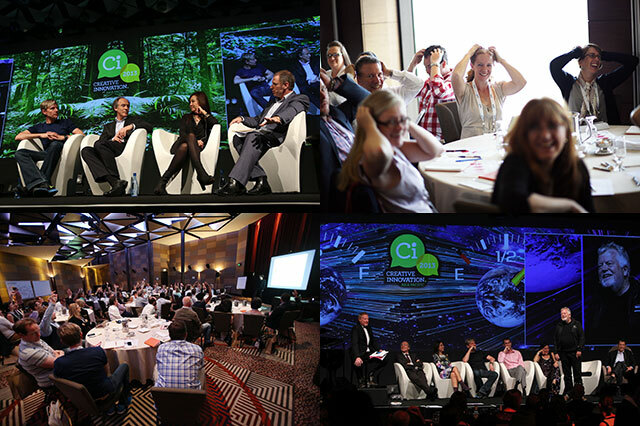 Ci2013 featured more than 40 international and Australian speakers, thinkers and leaders. Creative Innovation 2013 Asia Pacific was named Corporate Event of the Year in the Global Eventex Awards and received massive media interest and trended NUMBER ONE on Twitter during the conference. Interspersed throughout the conference were artistic talents creating art, poetry, music and comedy to transport delegates into a right-brained headspace of possibilities! Everyone shared their experiences and had the opportunity to participate in the discussions during the deep conversations, master classes, Q &A sessions and lunchtime hotspots. The event also honoured 10 scholarship winners making a difference through social innovation and enterprise. Ci2013 attracted over 700 participants over the 2 day conference, 2 deep conversations, 12 master classes and Gala Dinner supporting Creativity Australia’s unique With One Voice social inclusion programs. The conference delegates included CEOs and other C-Suite executives and Directors of major ASX-listed companies, owners of SMEs, advisors, influencers, entrepreneurs, academics, and leaders and emerging talent from health, banking, finance, advertising, arts, media, education, industry, innovation, manufacturing and government sectors. Over 40% of the delegates were from regional areas and interstate and there were also a number of international delegates in attendance.